I assume you mean one output going positive and while a second output is going negative. To do that just add a second IC and use ½ of it as an inverter and the other half as a buffer this will give two outputs that are 180 degrees out of phase with each other. Note: One LM339 can be used in place of the two Lm393’s, as it is the quad version of the 393. The 555 is a great little chip, with untold uses, but trying to do this with it is an exercise in learning how to tear your hear out. The last and wonderful thing we need to do is to ISOLATE the low voltage signals from Oscillator to Gates, from the Source-Drain Higher Voltage that also needs to be regulated to higher levels...where I plan to use an Opto-isolator chip, to do this job. When I originally designed this circuit it was meant to be use as a pulse width modulated signal for a motor speed control. As such I have used it with both P & N type fet’s and it has worked well. However there is no reason they cannot drive an opto-coupler. The chips output is an open collector transistor (emitter to ground) and able to carry 16 milliamp. That is an awesome circuit! Is it still a "Single Collapsing Field Story"? Is still an "Inductive Collector Circuit"? The purpose of the Opto Isolator is to avoid MOSFET's to feedback HV to signaling low voltage circuit, in case they go bad and short out Low V circuit Gate with Drain or Source...that's all. I would like to send High Voltage Pulses to Coil with this square wave signaling. I appreciate your help here, my friend! Last edited by Ufopolitics; 04-03-2012 at 09:27 PM. The little UFO was for camera "show"...hehehe...but also oriented identical. If we do it the other way...the magnets will just shake but no levitation. Did you run the motor yet? Hello, I'm new on this forum, and I were led here through my searchings of Nikola Tesla, and his Tesla Generator, since I'm searching for information, self teachings, and truth about the Alternative Renewable energy, and the conspiracies surrounding these important ideas. Now I'm just rushing to a question with no prior knowledge or advanced electrical skills, and I only read half of the threads on this Topic, sorry. But I saw your Anti Gravity Experiment, and noticed the alien aircraft recordings at the end. I read You have researched Nikola Tesla...so there may be a chance you have glanced at his Extra Terrestrial side...and also to His Anti-gravity development. If You also read and see video demonstrations from John Hutchison, will also find a lot of info there related to UFO's, Anti-gravity and Electromagnetic Fields..
Anti-Gravity develops in ANY object, no matter its composition, however electromagnetic fields are very closely related to anti gravity. The UFO at the end images are from the Jerusalem UFO on Jan 2011...there were many different angles views from different points...they say it was a big movie to be produced...coming soon to a theater near you...it never happened. And I, particularly believe it was a completely real event. Thanks for sharing your experiences, are very interesting. I have read all pages of this post. I put the second diode on the coil and noticed a voltage reading that I find it curious. Multimeter in 1000v DC-Hv, no load in output coil. Probe + in cathode of the collector diode. Adjusting the pulse width changes the output voltage reaching 500v. Over the range tested observed the same difference of 4-5 volts. My next step is to replicate Ufopolitics first experiment. I hope not to bore you with the doubts. Last edited by Ufopolitics; 05-22-2012 at 03:21 PM. obvious that you know what u r doing and what r u talking about. After reading of whole thread is almost all very clear and based on that I've made some circuit modifications this evening as I have some spare time now. output. This solution will lower ripple current half. Another solution is to make double filter stage. energy will change from cold to hot again. Ufo can you confirm that fact ? 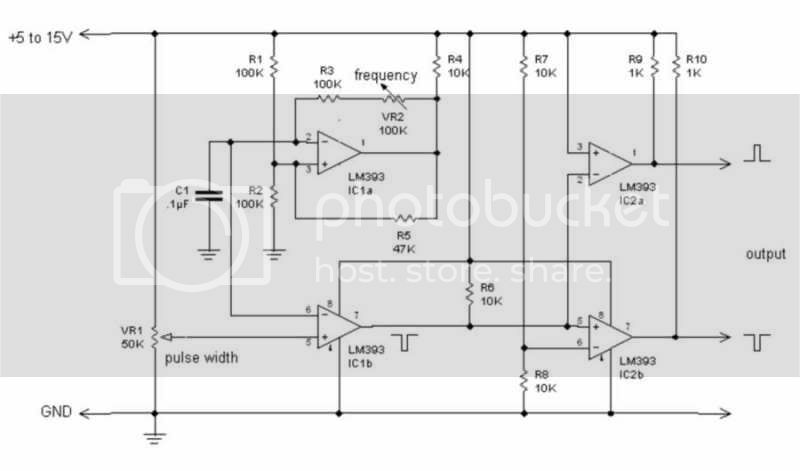 And my last post today is suggestion for precise driver circuit based on ICL8035 and his equivalents. You can adjust freq, duty cycle, and other parameters as will. Output is SINE / TRIANGLE / PULSE. other purposes. See google for connection pictures. highlighted. Picture is in att. Yes it will return Cold to Hot, so you are right about driving a regular brushed motor will be better using just cold. But when using it to drive other hot equipment, then it needs to be converted, or, it will blow their Caps at the Input Power Source...what a shame Ah? Tesla played, designed and patented Oil based Caps...for HF Currents. When you do your first testing, will notice your output (after diodes) is pretty amplified...measure Amps and Voltages at output please. I have a video coming soon ( Part 3 of Defining RE Field) where I show two ways of inserting secondaries and obtaining HV Output in the two magnetic field planes (Horizontal and Vertical ) relative to Primary Coil. And they will also open a big hole in your meter circuit board if you try to measure them...It did it on one of my Extech's, a hole from one side to other...a HV arc, I suppose inside, is the only thing I believe could do that...while meter was showing O.L. (Overload). Regards and I hope I had covered must of your questions doubts. thank you for answers. I had some spare time again yesterday, so I've designed custom made 2 chanell generator. By this subject will be covered in next topic. Now back to your response. Can you send me rough sketch of two 555 oscillator and power stage you have made ? Frequency sweep from low ho higher to invoke this lady is very good note. I didn't know that. one point, I assume. Is that right ? Or multiple points (as there ara harmonics), but one should be max.peak. I will do tests once generator and coil will be built. coil with more turns its clear, but how to avoid hot induction there ? Loose primary coupling ? Connection ? Hi Cinan, I am interested in your more advance version. But I rather prefer to buy the board already wired and programmed from you, since I am an illiterate in microcontroller programing. Give me an e-mail address to which I can write to you, please. You are of very good help here, indeed. I plan to build a big coil to try replicating ufopolitics's discovery.